These are probably one of the common trilliums of forests in central and western Ohio. As I was posting this, an idea popped into my head. I really should pose an American toad below the leaves of this little plant! 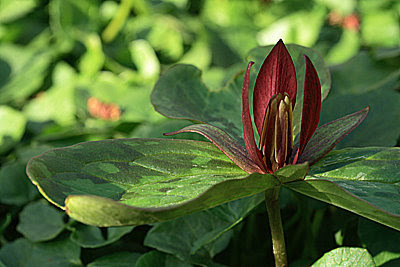 Trillium sessile is really quite a descriptive scientific name, since the flower has no noticeable stalk whatsover- we botanists call this condidtion "sessile", although the latin name is pronounced SESSILEE. That is just gorgeous. I'm loving all these spring flowers. Interesting and beautiful...by all means give us a toad, too! Lovely photo of a beautiful flower. Trilliums are such great plants, no? Never even heard of this Trillium before! Great photo!